ILM, Animal Logic, Digital Domain, Framestore, ILM, Lola VFX, Luma Pictures, Scanline, Rise VFX & Trixter Studio worked on Visual Effects for the movie. There are total 2124 VFX shots in the movie. Christopher Townsend lead as overall VFX Supervisor. The primary challenge for TRIXTER was to blend the 70 CG digital Goose shots with real live action cat footage.“Although there were four cats on set all playing the same Goose role, and we received reference videos from the cat trainer, it was still hard to achieve seamless back to back CG takeovers of Goose,” explains VFX Supervisor Dominik Zimmerle. “We created Goose’s CG fur using Yeti. It was important to match the fur texture and clumping patterns of Reggie (the main cat on set); his fur was more scruffed up on his back and his belly fur was longer and fluffier. Matching our CG fur to the real cat fur was a huge challenge, as was achieving the natural interaction between Samuel L. Jackson and the CG Goose.” The team used the ZIVA muscle system to achieve the skin deformation, sliding and jiggling so Goose appears to move in a lithe, fluid and realistic way. The largest sequence within TRIXTER’s body of work was the Mindfrack ship escape, which sees Vers battling to escape the Skrulls and their ship. TRIXTER was responsible for the extensive damage to the ship throughout the battle, the energy effects from the Mindfrack machine and the ship’s core breaking. Carol’s photon powers and many other effects like the Skrulls’ shock stick weapons and the ships consoles (christened “dough balls” by the VFX crew) were also completed by TRIXTER. Throughout the escape sequence, Carol’s efforts to break free of her cuff restraints increase, so TRIXTER had to ensure the gradual intensification of the energy building and glowing through her hands was consistently applied. From the initial battle in the interrogation room, the fighting moves to the ship’s core, where the most dramatic battle damage takes place. The destruction of the ship was primarily created in Houdini and the FX team were meticulous in ensuring that the incremental damage was consistent with the action. Another set of hero shots see Carol hanging onto the core of the ship, before blasting herself through a door into relative safety. Larson was filmed on set against blue screen hanging from a rig within a partial practical ship set. TRIXTER created the CG space environment for the sequence. In one of TRIXTER’s most challenging CG shots, the team replaced the practical set piece background wall with an animated continuously breaking one by adding debris and airflow to the foreground as well as several impact explosions from the debris hitting the energy core. Digidoubles of the Skrulls were created for some fight scenes along with additional Skrulls who are sucked out of the ship. Compositing was integral to the success of the final sequence, from rig removal to paint work and the further removal of stunt rigs for the practical fighting. Another notable aspect of TRIXTER’s work included Captain Marvel’s primary energy weapon, the Photon Blast. This was the first asset TRIXTER began working on even before principal photography began. Dominik and the team were responsible for developing a weapon style that had not been seen before in the MCU, the blast had to appear connected to Carol and its power wielded from within her. Marvel supplied TRIXTER with extensive still and moving image references. This combined with internal concept art, resulted in a finalised asset being developed and set up in Houdini, which was locked and shared with other vendors for use throughout the film. Rising Sun Pictures produced nearly 300 visual effects shots for the movie. The studio executed a host of challenging visuals for the blockbuster production including a fully 3D subterranean aircraft hangar stuffed with military gear and fabricating a series of shimmering holograms. Framestore delivered 130 shots. Chris Townsend, the film’s overall VFX Supervisor, tasked Framestore with building the Kree’s sleekly-designed Helion spaceship as well as setting the scene for the alien planet Torfa, where the Kree warriors would battle their foes the Skrulls. Framestore’s talented team ensured the visual effects continuously supported the film’s character-driven narrative. Key to the Kree’s initial encounter with the Skrulls in the film was the dark, daunting mood of Torfa. The planet is bathed in a curious half-light (which saw the team shoot during nighttime to have full control of lighting) and swaddled in a dense, murky CG fog. “This was our chance to really show the audience something alien and otherworldly,” explains Christian. 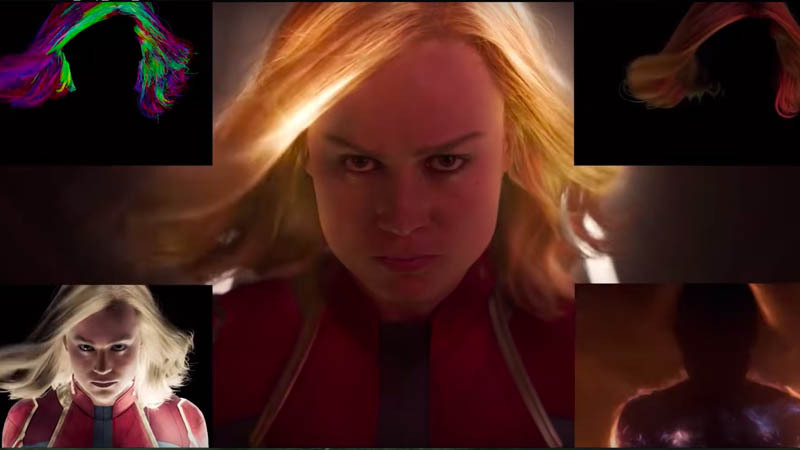 “We wanted cinemagoers to live this moment with Brie and her team, to really feel like they were somewhere they’d never been or seen before.” The area was surrounded by mountains and the VFX team needed to identify the precise level of detail that would fit within the space, as well as the appropriate camera angles. “For the look of the sequence it definitely helped to capture the special effects on location within the plates,” says Christian. As the Kree make their grand underwater arrival, time suddenly slows down. From both an animation and simulation standpoint, it was challenging to apply the same physics to two different timescales within the same shot. Jumping from real-time to 500 times slower, all simulations from bubbles, costumes and Mohawks had to be accounted for in the slow-down before things reverted back to real-time. “That ‘bullet-time’ sequence was really fun to do,” says Christian. “It puts you to the test, because you have to balance creativity with pure science: how can we make this look awesome and photoreal, but also obey the rules of maths and physics?” The team came up with a way of implementing the slowed down animation into effects simulation in Houdini, guided by Brie’s subtly animated performance. For the Torfa environment surrounding the Temple, the team utilized an extensive amount of on-site photography from a quarry in California, as well as a drone photoscan of the set, which provided a geometry base to build from. These reference points were used as a basis for modelling, and procedural tools were utilized for set extensions. As with many things when it comes to a superhero movie, it quickly became apparent that bigger was definitely better. The Torfa landscape evolved, eventually spreading to four times its initial size. The team was also involved in animating characters and Skrulls with digital double takeovers, which were part of the main fight sequence.